I’ve been meaning to do this project for a couple of years now and I’m happy to have finally gotten around to it. I have a professional one of these and it’s just too bulky, it ends up taking up more space instead of saving some. These are perfect for travel as it can hold not only your makeup brushes, but your mascara, lip gloss, eye liner pencils, etc. It rolls up into a really small case, making it ideal for traveling and I think they’d make the perfect graduation or bridesmaids gift. I’ve made a few of them, playing around with different fabrics, colors and stitching so I’ll give you the tutorial for the basic one and show you some variations at the end! 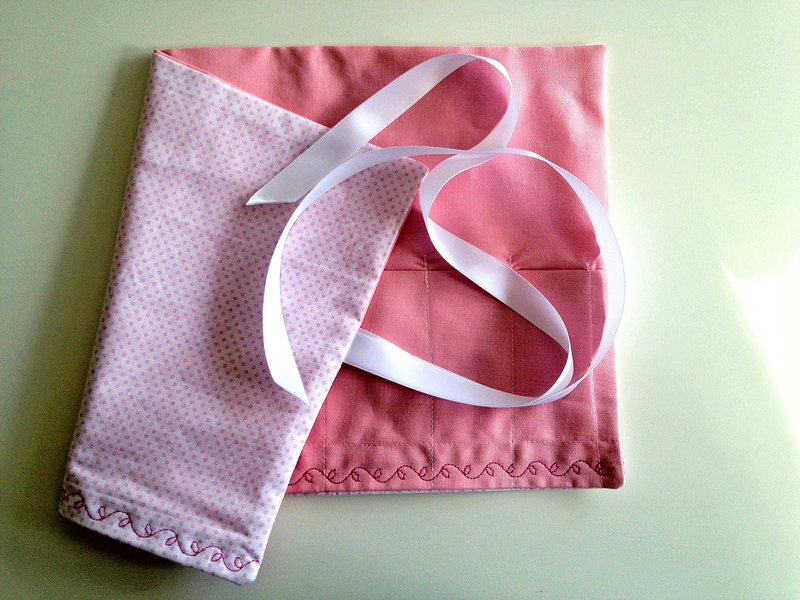 Start off by cutting your fabric: One exterior pice measuring 15″x 9.5″, two lining pieces measuring 15″ x 9.5″ and 2 ties measuring 18″ x 1.5″. Fold one of the lining pieces in half lengthwise and press. Lay the pressed piece on top of the unpressed one and pin along the through both pieces 1.5″ up from the bottom. Sew along the pin line. Now you’ll start to sew in the slots for your brushes. Mine has five 2″ slots and two 1.5″ slots, but obviously you can adjust your to whatever you’d like to accommodate your brushes. Start by measuring in 1″ from the left side and mark with pins. Measure 2″ over from that and mark another line with pins. Keep measuring over 2″ until you have 5 slots then measure over 1.5″ for two slots. 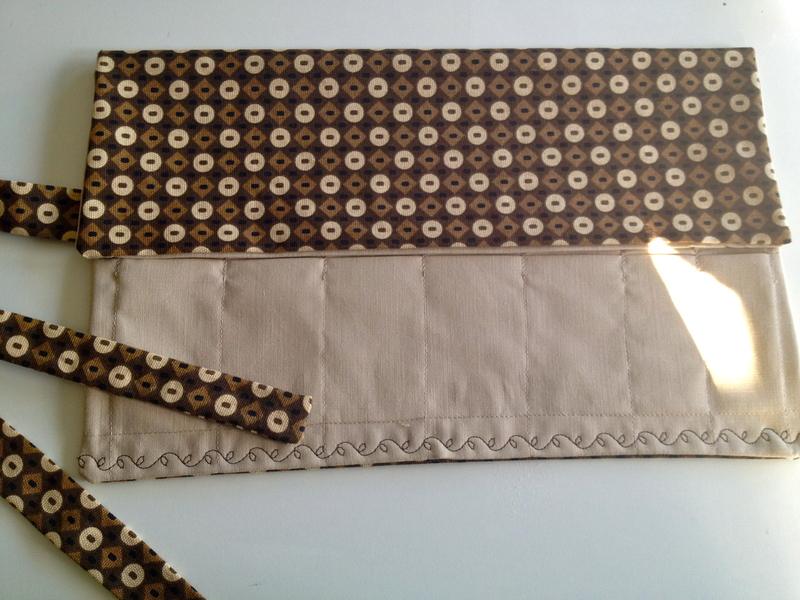 Once all the slots are pinned, sew them in place from the bottom to the top of the pressed lining. Notice once I got to the tops of the slots I re-enforced them by reversing and then going forward agin twice just to give some stability. The next step is to prepare your ties. Fold them both in half lengthwise, so that the right sides are facing and press. 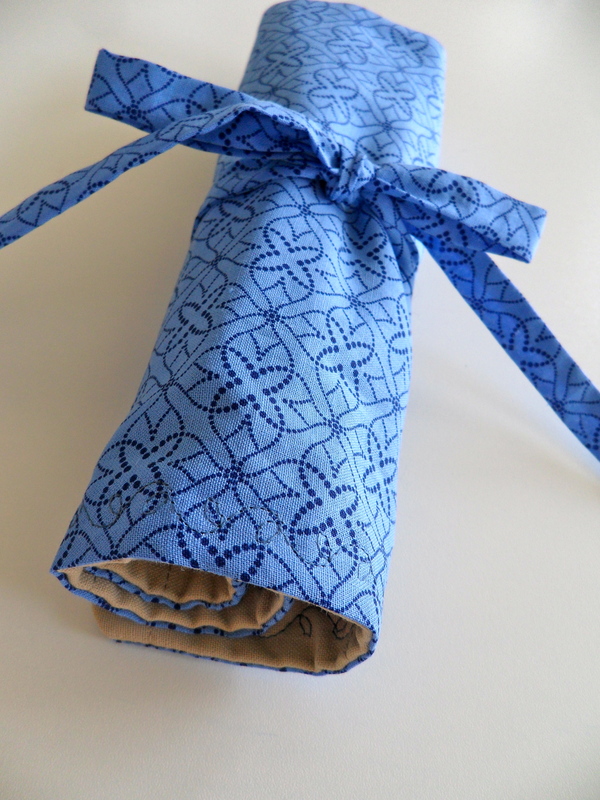 Sew along on end and the entire length, clip the corner, flip right side out and press. 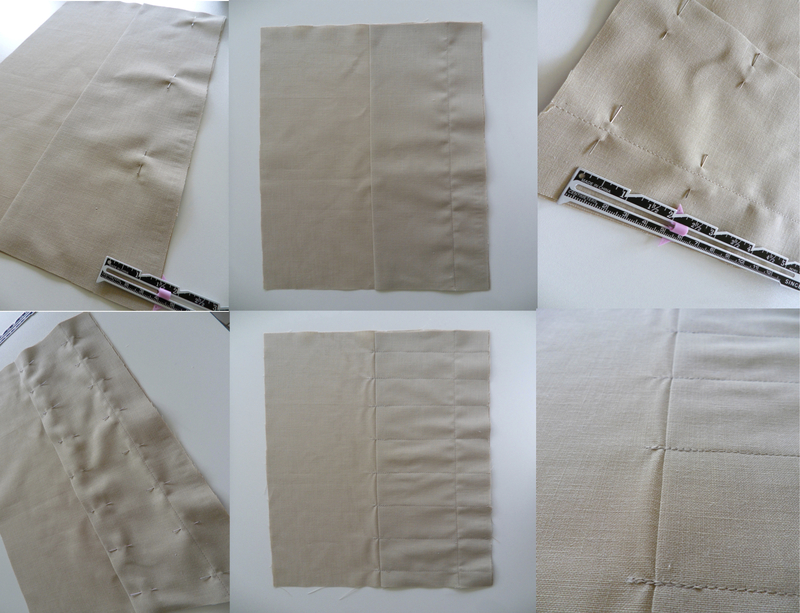 Place your exterior piece of fabric, right side up, on your work space and line up the unsewn edge of the ties (facing inward) halfway up the right hand side. Fold up the ties and pin them to the middle of the exterior piece so that it doesn’t get accidentally sewn up when we sew along the outside. Place the lining piece, right side down, on top of the exterior piece and pin along the outsides. Sew along all four sides, leaving a gap of about 4 inches in the middle of the bottom (so that you can flip it through this hole). Flip the bag right side out and unpin the ties from the center of the exterior. Press the bag so that the bottom hem is totally straight, even though there is a space in the middle that isn’t sewn. To close up this gap, pick a decorative stitch on your machine, and sew a straight line along the entire bottom of the bag. Make sure it’s close enough to the edge to catch the seam. 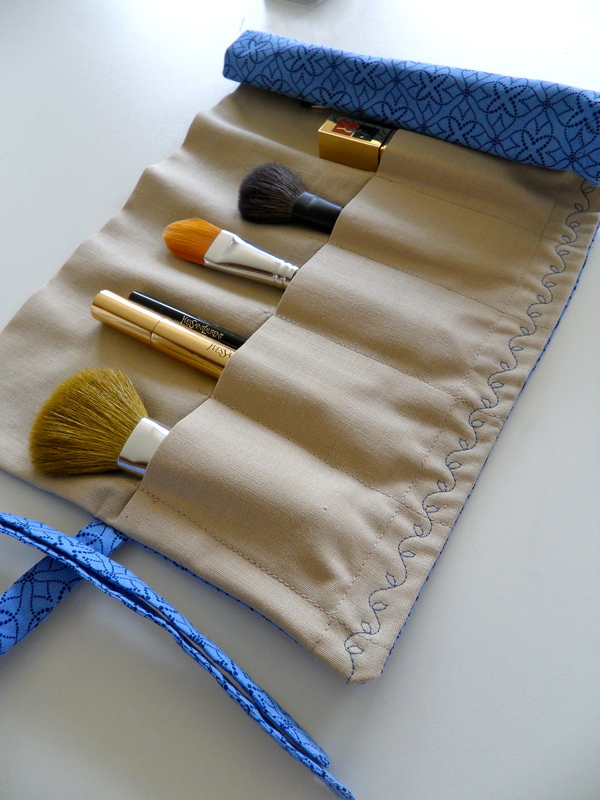 You’re now finish with your bag… add in your brushes, roll the bag up and secure it with the ties! If you want to ensure that none of your makeup shakes loose and gets on anything in your bag, you can add on a protective flap at the top to totally encase your brushes. 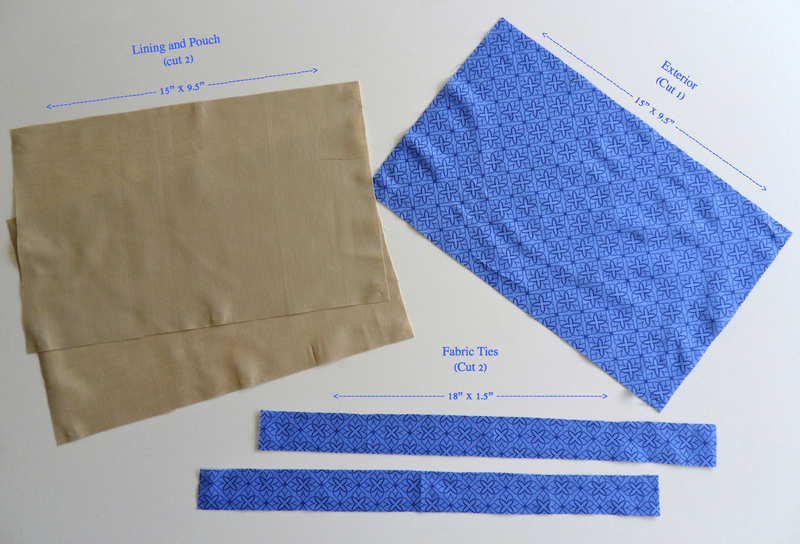 Just add 4.25″ to the exterior piece and one of the lining pieces (making them 15″ x 13.5″). 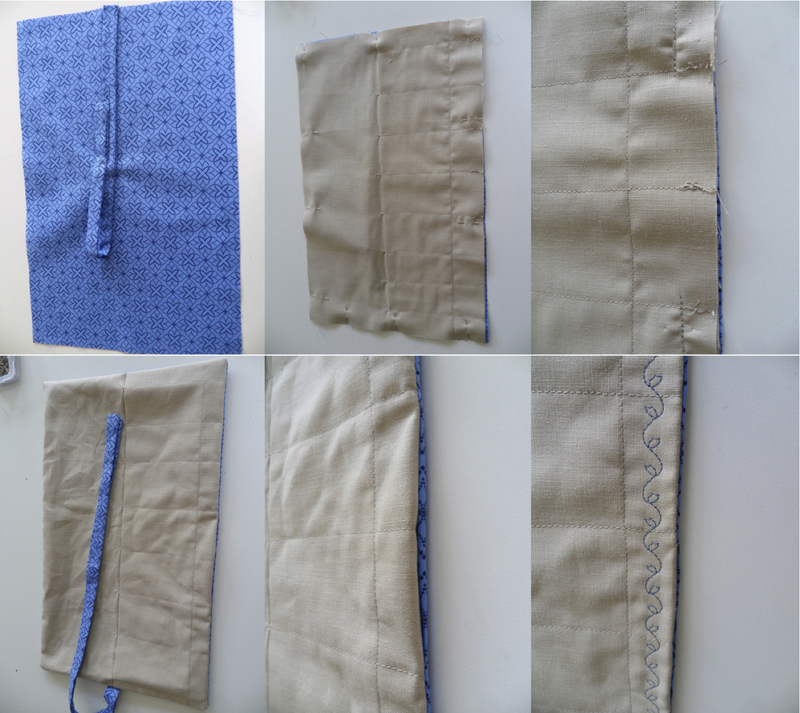 Follow the same steps and at the end just fold the top down 4.25″ and press it to create the flap. Play around with different color combinations and stitching along the bottom to come up with really unique bags! You can also use ribbon instead of fabric for the ties, just melt the ends with a lighter to seal them and stop them from fraying. You can also use these bags to hold pencils, crochet hooks or knitting needles, gumpaste tools, etc… the possibilities are endless! !